Le Couvent des Minimes Leg Lotion that is perfect for summer. The cooling formula has purifying mint and lemon to revive and refreshes tired and legs so you can bare your stems in confidence. When I first catch sight of the bottle I'm drawn to the old fashioned lettering and the black and white pictures that seem forever ago. Reminds me of some sort of vintage portrait, so to me, that's a clever packaging idea. I'm sure many of you can't see the fine print on this lotion bottle, but it actually says, "Hiker's Leg Healer". So although fragrance reminds me of just a luxury lotion for your arms, legs and hands, it's really meant for people that have tired aching legs, and/or feet. 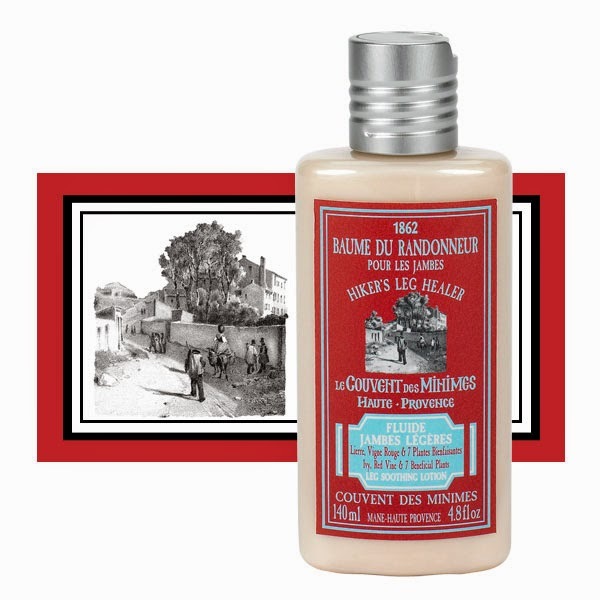 Le Couvent des Minimes Leg Soothing Lotion: Revive and refresh tired and dry legs with this comforting formula. Grapeseed Oil and Shea Butter deeply hydrates and repairs skin, while Ivy, Red Vine, Cypress, and Spearmint help to reactivate microcirculation. Purifying Alpine Mint, Lemon, and Listea Cubeba provide a delicate fresh scent.